Over time, canvas awning fabric suffers wear and tear form the elements, especially in our city where there are four seasons in one day. Our selection of awning recovers in Melbourne are able to breathe new life, into awnings that may have lost their look and functionality. It is often a better idea to replace the parts that are worn or outdated, rather than spend hundreds, if not thousands on the installation of replacement awnings. At Blinds4Less, we can make any type of canvas awnings look and operate the way that they did when they were first installed. 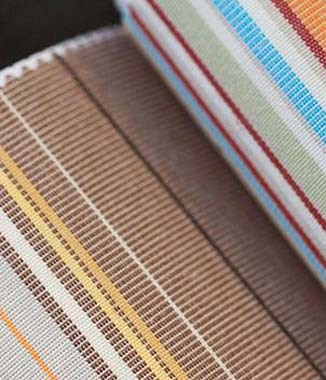 We have a huge selection of traditional and contemporary designs, and we are confident that we have a fabrics to match any existing colours and styles that you may have. Have peace of mind knowing, that should our canvas awning recovers falter under normal working conditions, we've got you covered. Proudly made in Melbourne to Australian quality standards. Our awnings are made using state of the art manufacturing technology. It is also fantastic to know you are supporting Australian made. All Blinds4Less outdoor blinds awning fabrics are cut with the latest technology laser cutters and fabric welders, delivering a squarer cleaner edge and reducing the risk of wear and tear. Our awning recovers use only the best tried and tested fabrics available. We know that not only will your new awning recovers look great, but will also last for many years. All Blinds4Less awning recover fabrics are treated with mould and mildew resistance. Should our outdoor blinds fabric develop mould of mildew within 5 years we will replace its fabric for free.